When it comes to your special day, no detail should be overlooked. From streamers, lights, music, food and overall ambiance, nothing should be left untouched. After all, your wedding and reception’s atmosphere is dependent on it. The love you share between you and your significant other is powerful and unique, a connection like no other. That’s why on your wedding day, you deserve a celebration that is as one-of-a-kind as your love. The first step to getting there? Making sure you create the perfect atmosphere for one of the most important milestones of your life. Often overlooked, the lighting at your wedding plays an important role. Without the proper lighting, your wedding photography may come out too harsh and your guests might not have enough energy to enjoy both your ceremony and reception. Take care in choosing the lighting for your event—regardless of venue. When it comes to indoor weddings, you’ll have more control. You can often choose from chandeliers, candles or a dimmer that can customize the amount of light shining throughout the night. For outdoor weddings, choose carefully based on temperature and time of the event. Natural lighting will, of course, be your best friend, but what do you do when the lights go down? Opt for stationary string lights and torches, bonfires for outdoor settings and lots of wedding sparklers. Make memories for a lifetime with your guests by getting them involved. Wedding sparklers are a huge hit with guests because of how easy they are to use and the magic they create. Sparklers are great for attracting attention to where all the action is. You and your special someone can run down an aisle bordered by your closest friends and family lighting the way through the night. Make the sparklers easily accessible toward the end of the night by setting up a station complete with lighters and buckets of varying sizes of sparklers. You can also decorate the station with memorable quotes and romantic mantras. Your wedding night should be one for the books, and setting the right mood is one of the most critical steps to reach that goal. Check out our sparklers for sale and give us a call at (281) 205-8999 if you have questions. 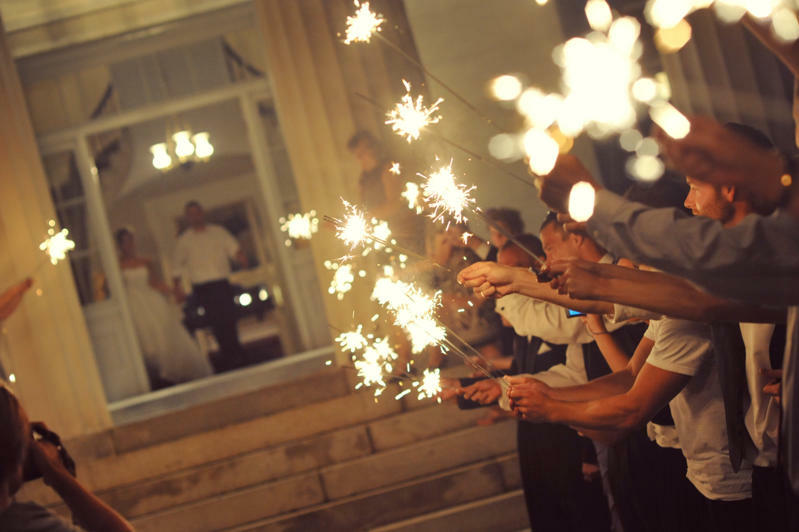 We offer a wide variety of sparklers and accessories to make sure your love will light up the night.